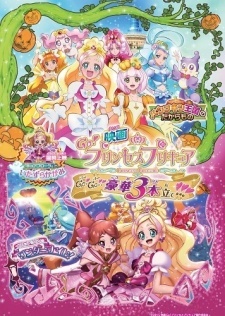 Plot Summary: Part 1, Pumpkin Oukoku no Takaramono, will feature the four Precure girls from Go! Princess Precure trying to rescue a princess who is held captive. Part 2, Precure to Refi no Wonder Night!, is set in the Night Kingdom lost its daytime, the Precure team fight to take the daytime back alongside the princess Refi. Part 3, Cure Flora to Itazura Kagami, will be a dialogue-less story featuring Cure Flora and a mischievous ghost in a mirror.